The usually reliable WebMD has a very nice quiz on fat that I recommend you take. It’s fun and can fill you in on some aspects of body fat that most folks don’t understand. Having said that, I would like to take exception to the final question in the quiz which asks which BMI category is healthier? Anything below obese; The low end of normal; Anything in the normal range. I wish we would do away with the BMI as a tool in evaluating fitness, health, fatness, you name it. First of all, a lot of people think it tells them their percentage of body fat. It doesn’t. A person’s BMI is calculated as her weight in kilograms divided by her height in meters, squared. It is an index, not a body fat measurement. The readings are as follows: Underweight: less than 18.5; normal weight 18.5 – 24.9; overweight 25 – 29.9; obese BMI of 30 or more. Second, it doesn’t take into account where the fat is distributed on the body. Fat around the belly is much more dangerous than fat elsewhere. 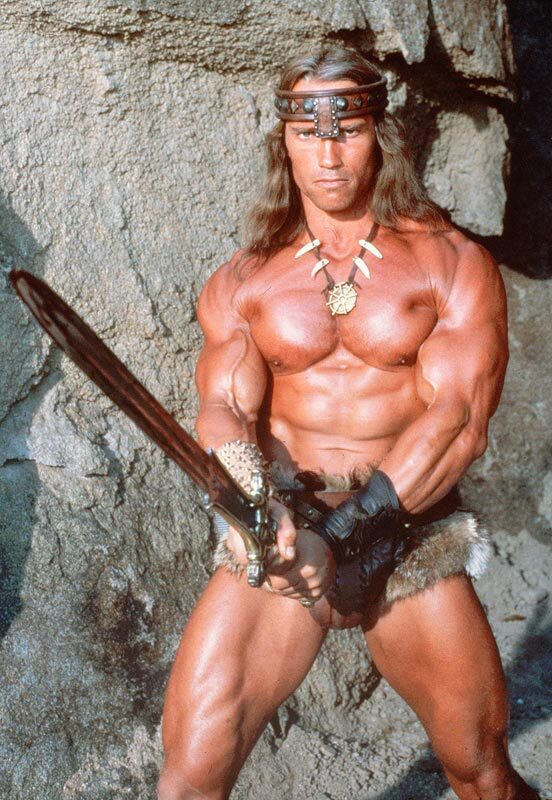 Arnold Schwarzenegger as Conan the Barbarian. Six foot two inches tall, 257 pounds, BMI 33. Not what most of us would call obese. “The usefulness of BMI is not great when considered on an individual-to-individual basis. In practice, BMI is most appropriate for large sample populations or in a clinical situation to quantify risk for a patient who is clearly overweight and overfat at the same time,” according to Professor Michael J. Ormsbee, creator of the Course Changing Body Composition Through Diet and Exercise which I am taking. Dr. David Edelson, MD, writing for the Obesity Action Coalition says, “…there is no accounting for differences in body frames, or even more importantly, body composition. You can read the remaining nine reasons at the link. I have written about belly fat several times – How bad is extra belly fat?, What about belly fat – central obesity? In addition there is: What is a good way to measure body fat? I think you are a lot better off with this tool than the BMI.